We have described them in the past as the best marching band that you've never heard of before, but at this point we think we have done enough work to make sure that every band fan in the country knows who they are. 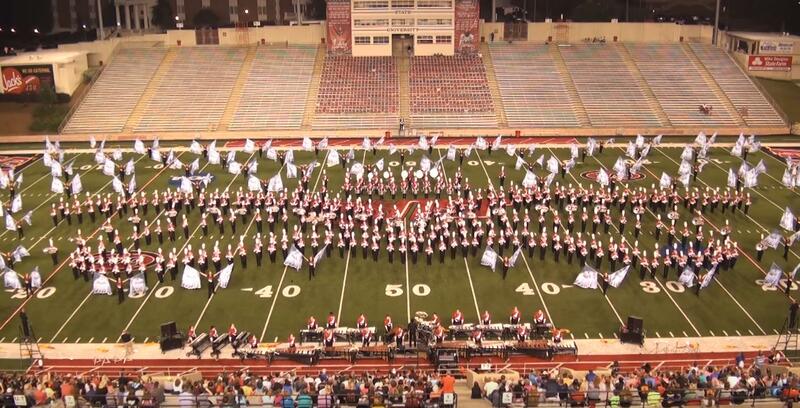 The Jacksonville State Marching Southerners are a force that you should never ever mess with. If you invite them to perform at an away game they will blow you out of your own stadium. If you invite them to a high school exhibition, they will be the band that everyone talks about. Because they are just that damn good. Their 2017 show is a special one. Last year the band lost a member of the JSU Ballerinas and to honor her the band's show is called Angels Among Us. It is a power packed performance that once again features their monster sound and corp style marching. You're watching a 450+ member band march a drum corp show. It is mind blowing. The finale includes some fantastic work by the guard that really pulls together the theme of the show and the arrangements are insanely complex. It's a beautiful performance and one that we will remember for a long time. Shout out to the "Cockpit" aka the JSU percussion front for those wild runs throughout the show. Those guys are working their butts off in this show and it is really good stuff. Thank you Ken Bodiford and the JSU staff for producing another incredible show for all of us in the band world to enjoy.